Tool Blog News No 4.0 Ah Batteries For Makita? Is 6.0 Ah Better? The World of Concrete trade show is going on right now in Vegas and all of the major brands are there showing off their new 4.0Ah 18-volt batteries. Well, not all of the brands. Makita seems to be taking a pass on 4.0Ah and thinks 6.0Ah is the answer. ToolStop, our friends over in the UK, had a chance to ask Makita UK why they have not released a 4.0Ah battery pack. So what was Makita's response? "Two 3Ah li-ion batteries equals 6Ah." What Makita is not saying here is that they will be coming out with a 6.0Ah battery pack. This is not code. They are saying their two 3.0Ah batteries are better than a single 4.0Ah. Probably not what you were expecting, but does Makita have a point? Remember, Ah is a capacity measurement, not a power measurement. The more Ah a battery has, the more fuel it has to run the tool. I am sure you are saying that, sure, 2x3.0 = 6.0, but 2x4.0 = 8.0, so Makita is still behind. The math might be right, it doesn't lie, but you are still wrong. There is another variable to the equation that you forgot about. How long does it take to charge these 4.0Ah batteries? Makita says that two of their 3.0Ah batteries can be charged in the time it takes a single 4.0Ah battery to be charged. I did some limited testing a few months back comparing the charging time of only 3.0Ah batteries, and Makita was the clear winner. So maybe Makita has a valid point? What are your thoughts? 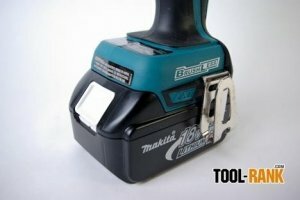 If it is as cut and dry as Makita says, would you rather have larger battery packs that take longer to charge, or Makita's smaller packs that charge in half the time and give you a 2.0 Ah advantage for every hour of charging?